Beach party decorations using colorful pails, shovels and sand toys can be used from your table decorations to serving your beach party food. 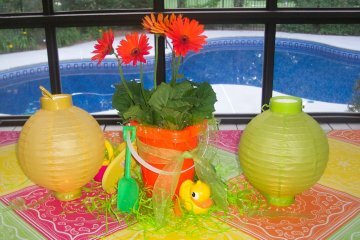 Use battery operated paper lanterns , flowers in a new sand pail, and a couple of new sand toys as beach party table decorations. I couldn't resist buying these bright orange gerber daisies at a local nursery for our pool party. 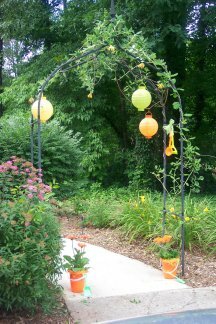 Placed in these bright orange sand pails, I set them out by the arbor entrance, the pool gate and on the food table. 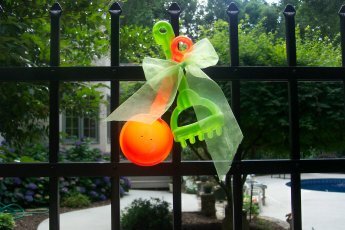 Using sand toys from the Dollar Store and brightly colored ribbon tie the toys to your pool gate to greet your guests. 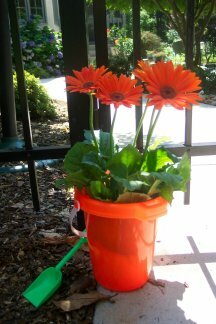 Set the orange Gerber daisies, or other brightly colored flowers in sand buckets by the pool gate. Scatter sea shells on the walkway leading to the pool. Our pool party guests walk through this garden arbor to get to the pool. So I start my beach party decor there hanging these brightly colored paper lanterns and sand toys from the vine that grows on it. Hang small beach pails on the ribs of your patio umbrella. 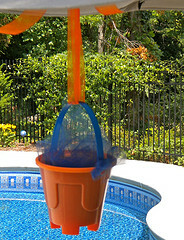 Tuck in some blue netting or tie a little bow on the side from colorful netting. You can use all of the same color sand buckets or use a variety of brightly colored ones. Try to repeat the color scheme in your paper goods and tablecloth. Beach party decorations need to include the swimming pool! Inflatable pool toys come in so many different styles and colors. You can simply have some inexpensive air mattresses floating in the pool, several large beach balls, or this pair of fun Flip Flop Floats. Have several large beach balls floating in the pool as pool party decorations.Get at least 24" beach balls and depending on the size of your swimming pool, have 8 to 12 balls floating when the guests arrive. For night time fun, use light-up beach balls - they light up when they are tapped. 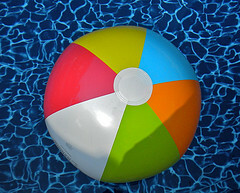 What a fun ball to use for pool volleyball. If the pool party is for smaller kids, then get a smaller size. 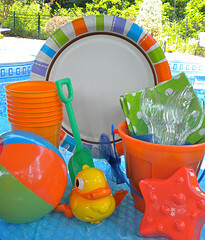 Beach party supplies need to be bright and colorful. I love these bright colored sturdy paper plates from Target paired with lime green polka-dot napkins. Use a sand pail to hold the napkins and silverware. Easy to clean umbrella tablecloths are used on the tables. I find that the disposable ones are too much hassle since I have to cut them and then tape them back together to accommodate the umbrella hole. Look for them early in the season at Target, K-Mart or Bed, Bath and Beyond. Place colorful beach umbrellas by the party entrance or party area. These large, striped umbrellas are only $12 at Amazon and would make a big impact to go with your party theme. See if any of your friends have beach chairs or surf boards that you can use as beach party decorations and set them out around the perimeter of the pool or party area.